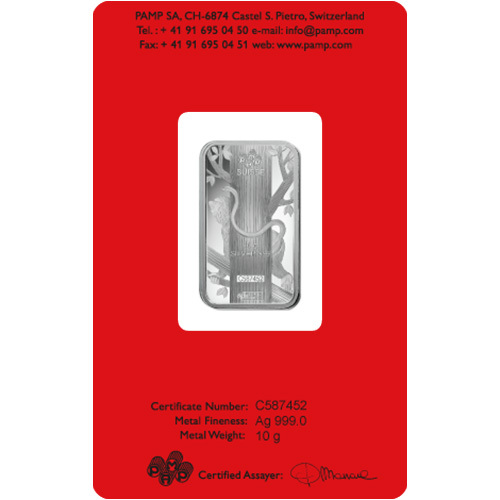 For those who buy silver bars, PAMP Suisse is a popular refinery. 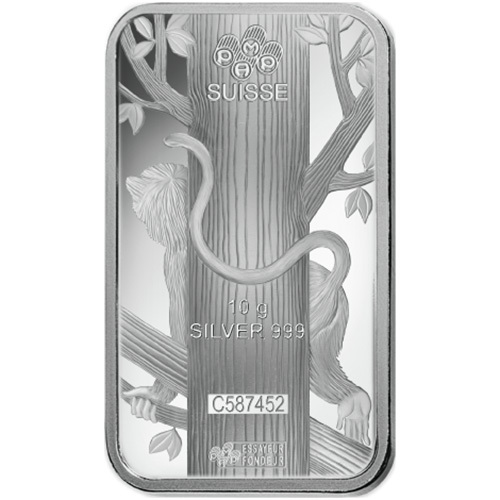 The Swiss refinery is known for its Fortuna, Rosa, and Lunar Collections of bullion bars that offer options in gold, silver, platinum, and palladium. The Lunar Collection is limited to silver and gold, but it boasts 12 different designs that complete the cycle of the Chinese lunar calendar. 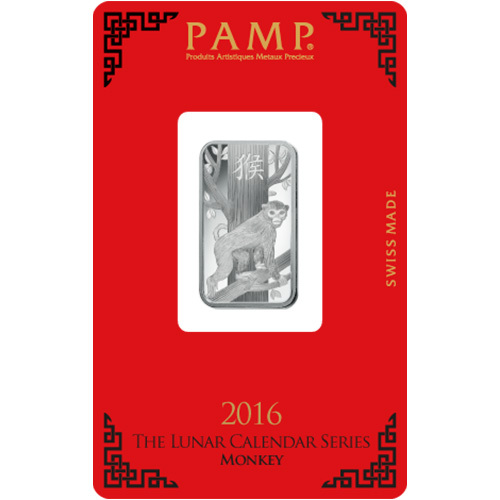 Today, 10 Gram Silver PAMP Suisse Lunar Monkey Bars are available to you online at Silver.com. Available to ship to you inside of protective packaging with an Assay card included with purchase! Released for the Year of the Monkey in 2016! Obverse features a monkey on tree branches. Reverse showcases the same monkey from behind the trunk of the tree. The story of the monkey’s arrival at the Jade Emperor’s meeting is one of luck. The monkey, likely as a result of loafing around or being too playful, had fallen behind the other animals in the journey to meet the emperor. However, the monkey used its playful nature to jump from tree to tree and one stone to the next to arrive ninth for the meeting. All of these 10 Gram PAMP Suisse Lunar Monkey Bars are available to you with individual protective packaging. The bars are housed inside of protective plastic and sealed by the unique red assay card of this series. The red cards are a nod to the tradition of exchanging money in red envelopes on Chinese New Year. The card includes the bar’s weight, purity, metal content, and serial number, as well as the certified assayer’s signature. 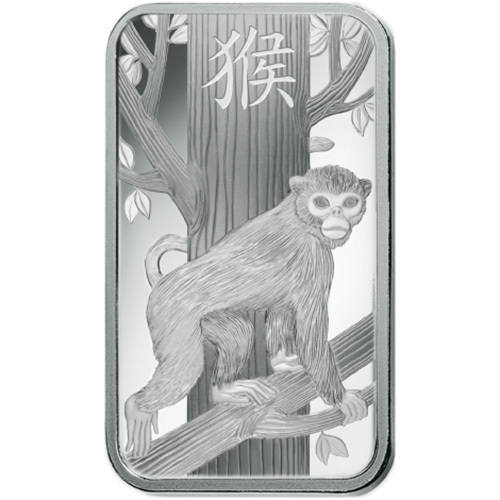 On the obverse side of all 10 Gram Silver Lunar Monkey Bars is the image of a monkey walking on its hands and feet along a branch. This branch crosses in front of a tree trunk that includes the engraving of the Chinese symbol for monkey. The reverse of 10 Gram Silver PAMP Suisse Lunar Monkey Bars features that same tree trunk, but this time it largely obscures your view of the monkey’s body. You can see the back of its head to one side of the trunk and its long tail curling around the tree trunk on the other side. PAMP Suisse was founded in Ticino, Switzerland in 1977. Today, it is known as the world’s leading bullion brand and is part of the larger MKS Group out of Geneva. Please feel free to reach out to Silver.com with questions. You can call us on the phone at 888-989-7223, chat with us online, or simply send us an email.